The M.A. Center in Melbourne hosted AYUDH Australia’s first youth retreat by Bramachari Shantamrita Chaitanya. The theme of the retreat was “balance”. It laid the foundation for lasting relationships, inspired vision and action. Br. Shantamrita discussed balance; how one can apply this concept in everyday lives. He also talked about the importance of yagna, the sense of being selfless in our actions. ‘Be like the rain’ is the way of service, falls from the sky down to the dirty ground to offer some relief, without expectation of receiving anything in return. 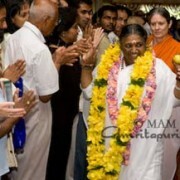 Every one was encouraged to follow Amma’s example of seeing Nature as our teacher and offer our lives accordingly. All were encouraged to try and do one thing each day to show gratitude and respect for Mother Nature, the sages of old and the present, the five elements, to ancestors, and humanity. The principle of balance was explored through a variety of means including a discussion led by Br. Shantamrita on Ayurvedic principles for eating and combining foods to achieve balance and harmony, as well as sessions led by local devotees. These included a talk on the importance of keeping a balance between alkaline and acidic foods and how blood types affect the food we eat, and a yoga class helped to learn about the physical and mental balance. AYUDH discussed the possible future activities. The importance of becoming educated about ways of achieving balance and sacrifice in the context of Nature, learning about energy efficiency practices, recycling and general environmental sustainability practices are the few things planned to do. The youths planted shrubs at the M.A. Centre are located on beautiful land with plenty of open space, trees and native flora. They had games, bhajans and campfire. The youths felt inspired, took a vow to implement the principles of balance and selflessness that had been discussed on retreat in their daily lives. They were thankful to Amma for planting the seeds of inspiration in them and becoming a torch to carry Amma’s light in the world.